The HTC One M9 arrived in full glory and users of last year's HTC One (M8) will certainly notice a few noteworthy differences between the two svelte devices. To be honest, more of these are hardware changes in the specs sheets. Not that the HTC One (M8) was a slouch - even by today's standards, the handset is a viable alternative to many other smartphones. Times are changing, however, and it's perfectly natural for HTC to stay up-to-date with the latest trends and amp up the game of its flagship representative on the market. But except for pure hardware arms race, what else has made its way inside the HTC One M9? 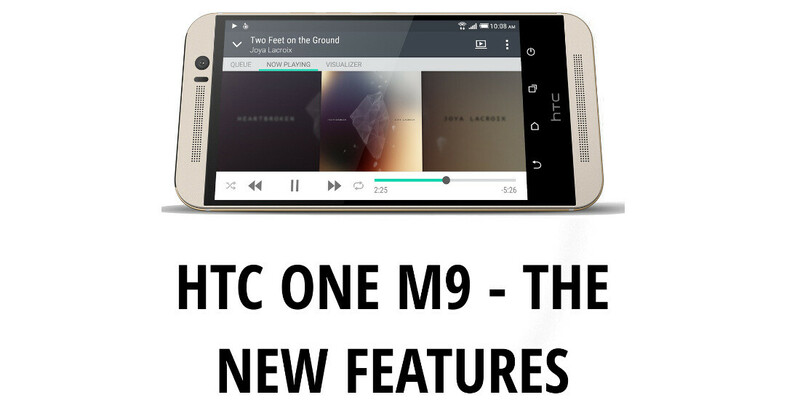 Let's take a deeper look and highlight the new features that any future One M9 users will potentially benefit from. Measuring 144.6 x 69.7 x 9.61mm, the HTC One M9 is more compact, yet slightly thicker than the One (M8), which clocks in at 146.36 x 70.6 x 9.35mm. Additionally, the new entrant weighs 157gr, while the One (M8) tipped the scales at 160gr. The HTC One (M8) came with a quad-core Snapdragon 801 chipset inside, but the One M9 is equipped with a newer and faster Qualcomm-made chip - the Snapdragon 810. The latter, as you probably know, is an octa-core 64-bit silicon - a perfect match for the 64-bot capable Android on board. We get 3GB of RAM inside the HTC One M9, an improvement over the 2GB inside the previous iteration of the One flagship family. Well, the device is not a 4GB beast, but the amount of memory inside HTC's 2015 representative would most probably cater to the whims of 90% of all users. HTC has fortunately nixed the under-performing UltraPixel camera that graced the backs of both the One (M7)/One (M8) and opted for a larger one, a respectable 20MP shooter. The UltraPixel camera of the HTC One (M8) had its merits, but it was generally under-performing compared to the competition. The new 20MP rear camera will potentially put it in the league of the big Android boys. In particular, it has an f/2.2 aperture, a 27.8mm lens, allows you to record 4K video, and has a protective sapphire lens coating. The One M9 secured a respectably-sounding 20Mp rear camera, but the UltraPixel one is still here to stay. It's on the front and will take care of your selfies. Specs-wise, the camera has an f/2.0 aperture, a 26.8mm lens, and will shoot a 1080p should you require it to do so. The HTC One (M8) boasted a 2,600mAh battery at the back, but its successor amps up this capacity to 2,840mAh. Paired with a more energy-efficient hardware and software, the One M9 will most probably outclass the One (M8) in terms of battery life. The HTC One M9 comes with Android 5.0 Lollipop out of the box. Naturally, it comes with HTC's Sense UI running atop. HTC's new flagship comes with Bluetooth 4.1 on board. In addition, the aptX audio-centric codec is supported, which is greatly improving the overall quality of the streaming audio quality. The new HTC Dot View that will be available for the One M9 will even allow you to play games on it, if you feel like it. Unlike the HTC One (M8), the HTC One M9 comes with a side-positioned power button, which is a pretty good decision. But no OIS? Really HTC? Told you, LOL!! G4 will have better sales, i even think if Sony does a better launch the Z4 will have better sales. I still stand by my comment. For the first half of the year, it's S6 and M9. G4 will be released in the summer so it'll go against the iPhone 6S and Note 5. M8 will have better sales since it will be free on contract and its pretty much the same phone. That's why 40% of the phone's presentation was making the case for a design of the phone that feels almost virtually unchanged. Papa you need to go back to the other article and give me a thumps up for noticing this. LOL. Lmao I'll do it right now. But here, take this +1 before I leave. How do you know that it won't have OIS? All I want is for the old dot view cases to be updated. That would be pretty cool. The phone feels somewhat uninspiring. They concentrated more on the design philosophy rather than doing more comparing and contrasting between its predecessor to make the case that you should upgrade your current HTC phone or buy this one. PA you need to stop posting the same article. You just posted what this article has in several other articles separately, there's nothing else to cover. Go see if Sony might announce the Z4. you name contradicts how apple rocking charts on smartphones business. 9.61mm so this phone is pretty thick! Im waiting on the details for the M9 Plus, hoping a quad hd screen with 4gb or ram. 64 bot? I didn't know that there was a 64 bot architecture. This is going to sell so poorly. It's regurgitating the design components that don't help differentiate it from a phone that's been on the market for a year and out of the mindset of consumers. Secondly, their 1080p display isn't even as efficient as the QHD AMOLED offerings as the panel HTC is basing their technology off of is S-LCD 3, a 3 year old standard. Meaning, no noticeable improvements in energy efficiency, color reproduction and all other parameters of the display outside of "tweaking"
It is a pretty phone, but they will run the risk of looking dated in the same way the most beautiful cars in the 80s do. No ois and the screen don't necessarily make it trash, but adds to the dated feel whether warranted or not. No home run for HTC. I disagree with the side power button. I think top is way better. Side power buttons get in the way of things like my vent mount (I have to place a phone in off-center so the power and/or volume buttons aren't pressed), and I sometimes press them accidentally when they're so low on the side. Even as high-up as they are on the Galaxy S4 and S5, I hit them accidentally sometimes, and I've heard others complain about it. I've never had any issues with a top power button, and people who do either are doing it wrong, or just have tiny hands. EDIT: Mostly, I just can't wait for Project ARA. Slide 11 is labeled wrong.